Mathew Alberg, a home schooled student in the Shirley area, entered an essay in the VFW 4513 and its Auxiliary patriots Pen contest for 6,7 and 8th grade students. The topic of the essay was “Why I appreciate Americas Veterans.” After winning first place, it then went to District, where it also won first place and was then sent to the State competition level. On Saturday, February 7, a banquet was held at the Marriott in Little Rock to announce the State winners. 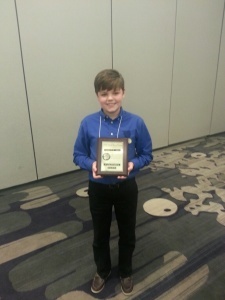 Mathew won again, and his essay was sent to Washington D.C. to be judged in the National Competition. We are so proud of Mathew and wish him the best of luck.